Measuring consumer interactions and analyzing their behavior is vital to improve your conversion rate and ROI. 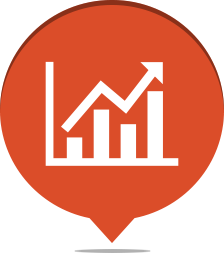 Our Google Analytics certified team helps you through advanced Google Analytics setup like advanced E-Commerce integration, custom dashboard & reporting, funnels/goals/event setting etc. Our team delivers periodic reports & insights that helps you to make you the right business decisions. All the data shared with Monks will remain confidential as we adhere to the strict Non Disclosure Agreement Terms. Monks will do a thorough audit of your Google Analytics and implementation. We will send you an insightful analytics report with our suggestions and scope of improvement. Below is the fragmented view of the advanced Google Analytics setup process. Initially, Monks will consult you to understand your business needs and requirements to analyze which features of Google analytics will be extremely useful for your E-Commerce business. Once we do the advance analytics integration, we will review the account for one week to ensure that all the changes done are getting tracked correctly. we will send you a detailed deployment report. We will set up the advanced analytics for your website that will enable you to track your customers behavior, their purchase history & web traffic, your channel performance and every other aspect of your E-Commerce business. Let Commerce Monks help you get answers to the questions you need to grow your business.